They married and had many children... This is love story of Leopold and Louise ! 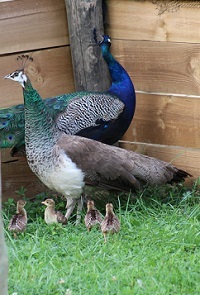 The couple of peacocks has been installed for several months in the new aviary of the Park. After evening of love parade and wheel, Miss The Peacock has succeeded in the quivering of the feathers of Mister The Peacock. Perched in their little house, Louise brooded for 29 days, going out only to feed, and Leopold watched over them, leaving no one to enter their house. Today, the are concerned parents and very protective with their offspring. But by the way, do you know how you call the little ones of the peacock ?